The United Bank of Africa,(UBA) New York United States writes in regards to the transfer of your fund which your payment file was deposited in this bank through African Clearing House as all modalities have been perfected by this body that control all African Financial Institution, for urgent transfer of your fund through our online banking system. 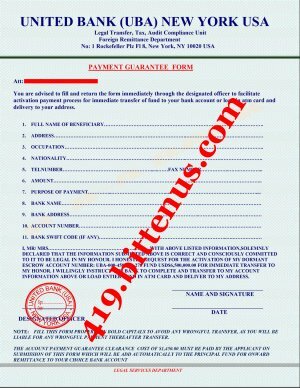 Your payment file is no more with Africa Banks, you are to be paid by UBA Banking Group USA, you should stop further communicating any bank in Africa and that was instructions from, ECB/ IMF Department. Your fund can be reload in ATM card or online on your demand as soon as we hear from you with the following details; you have to stop any further communication to avoid sending money to Africa for no reason. However, this Bank has been fully mandated to transfer the total funds to you through our online banking system and you're required to furnish us with this listed information for your online account setup. THESE ARE THE INFORMATION NEEDED TO CREATE YOUR ONLINE BANKING ACCOUNT SETUP, AND WE WILL LODGE YOUR FUNDS IN THE ACCOUNT AND SEND YOU THE ACCOUNT DETAILS IN 24 HOURS. Please, All fields with asterisk (*) must be filled. State of Origin *:. . . Date Of Birth*:. . .
Zip / Postal Code*:. . . Please Note that the Bank is not liable to fix any error caused by your incorrect filled form. Be rest assured that all your information submitted to the Bank Transfer Department is 100% secured and safe, therefore fill in correctly. Note, if you don't have some information like Social Security Number (SSN) and Passport Number, kindly fill in with "N/A" other information is highly needed, fill correctly. Thanks for your prompt response, as law demands for successful of your transaction, your advice to print out attached document fill it and sign below and return back with needful so we can do the needful and transfer your fund direct to your bank account or load the entire fund in ATM CARD and deliver to your address with access pine code. Anticipate your prompt response to serve you best. Help us to serve you best.